In Sankey diagrams from Excel and Creating d3.js Tree diagrams the input data for these d3.js visualizations was of a specific layout. We are now going to look at a more generalized data structure, in this example, to be used as input to a d3.js force directed graph. I’ll probably go back and change the others to use this standardized structure later too. Note that, as usual, none of this stuff really works with IE. d3.js uses svg, whose Wikipedia entry talks about various svg plugins for IE. I havent tried them – if you do then let us know on the forum. Better to stick to Chrome, Firefox or Safari which support svg as standard. We are going to use this example to demonstrate how to create force directed graphs straight out of Excel without any need to prepare the data in any special way. 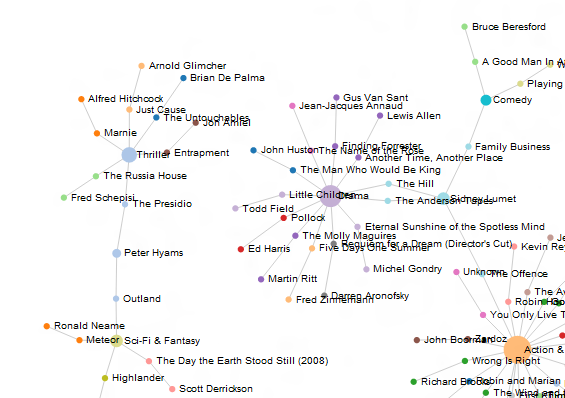 Here’s a snip of plot of Sean Connery Films and the connections between genre and director. 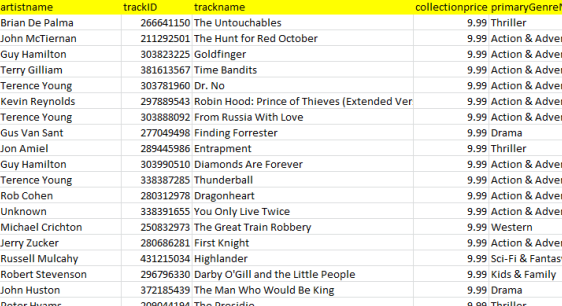 This was a simple iTunes query using Rest to Excel library Here is the live interactive version. You’ll see when you move these around in the interactive version everything else moves as well. During the linking process a count is kept of the number of times a node is seen. Normally this is updated by 1 for each one. Optionally this count can be used to change the size of the circle representing a node (seen a lot = bigger node than not seen much). It may be that you want to use some other characteristic. If you specify a column here, then whatever data is in that column is used to increment the count by – so you can size circles to some other characteristic such as revenue, population or whatever else you are analyzing. Earlier I covered the use of ‘count’ to modify the size of a circle. If this parameter is blank then all the circles will be the same size – the value specified in the radius parameter. If it says ‘count’ then it will be adjusted (according to the formula described here) using whatever you used for the count parameter earlier whilst collecting the nodes. Later on I will add mode valid selections for this parameter. If you specify ‘label’ as the value for this parameter then you will get static labels (as specificed in your labels parameter) on your chart. Leaving it blank means you get no labels. The font size will be as specified in labelFontSize. Later on I will add mode valid selections for this parameter. These probably don’t need to be touched unless you understand d3.js and want to change the chart behavior in some ways you cannot accomplish through options. The example workbook is part of the cDataSet.xlsm file which you can download here. The parameter sheet is the d3ForceParameters worksheet and the example data used here is in (or can be generated in) the ItunesMovie worksheet. The whole thing is kicked off by a command button in the ItunesMovie worksheet which runs the ‘d3forceHere’ procedure. To run on another sheet, just copy the button to where the data is.